Managers face multiple challenges in the workplace, but one frequently recurring challenge is that of managing different generations at once in the same workplace. In recent years we’ve witnessed the emergence of four (and soon five) generations in the workforce. Differences and diversity can help build a highly productive environment, but the management of these differences is key to any workplace success. From the 18-year-old intern to the 72-year-old seasoned professional, each generation has its attitudes, mindsets, preconceived notions and experience. We can at least agree on is that there is certainly no single approach to dealing with them all. In this blog post we’ll study these differences, but also the preferences of each generation, in order to better understand each generation’s behavior, motivations, fears, etc. By the end of this post, you’ll have a clearer idea of each generation’s specific traits. This should help you find a balance between them and a method of expression that reaches every one of them. 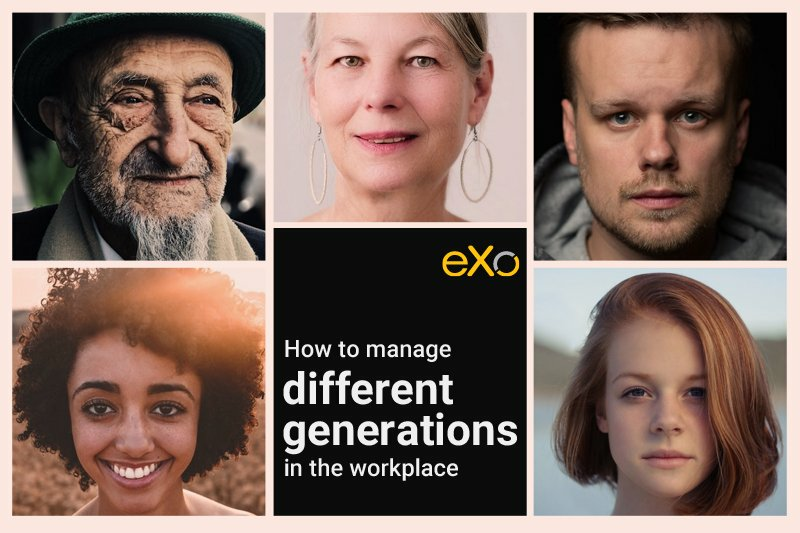 5 generations one workplace: what are the issues ? Even if this mix of behavior adds diversity to a workforce, it creates challenges and obstacles. But these obstacles can be turned into an advantage and an opportunity to grow and evolve, if faced correctly. Let’s study these differences in greater depth and see how we can turn them into opportunities. 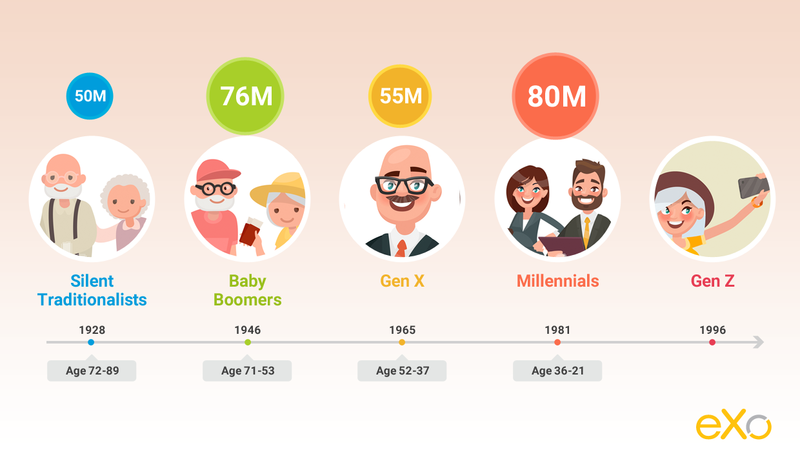 While baby boomers are perceived as more “ reserved”, millennials tend to be more collaborative. They have never known life without a computer and a smartphone, and where knowledge is available at their fingertips. Some can’t even remember a pre-Internet world. This extremely tech-savvy infographic sums it up. For that reason, each generation leans towards its favorite communication tool and style. In person: This is how traditionalists prefer to communicate, especially when it comes to meetings or one-on-one discussions for important information. Phone Call: Both baby boomers and traditionalists prefer phone calls for important information. But baby boomers are considered tech savvy, even if we may think the opposite. In fact 60.7% of baby boomers own a smartphone, which is quite a high proportion. Email: Gen Xers are the ones who prefer email correspondence the most. Baby boomers and millennials, on the other hand, accept its use in business. Text: Texting is the most preferred communication method of millennials. They find it easy and common. Social Media: Millennials consider social media as part of their life, and they usually don’t differentiate between what’s personal and what’s professional. They are also active on a variety of social networks, beyond just Facebook and Twitter. 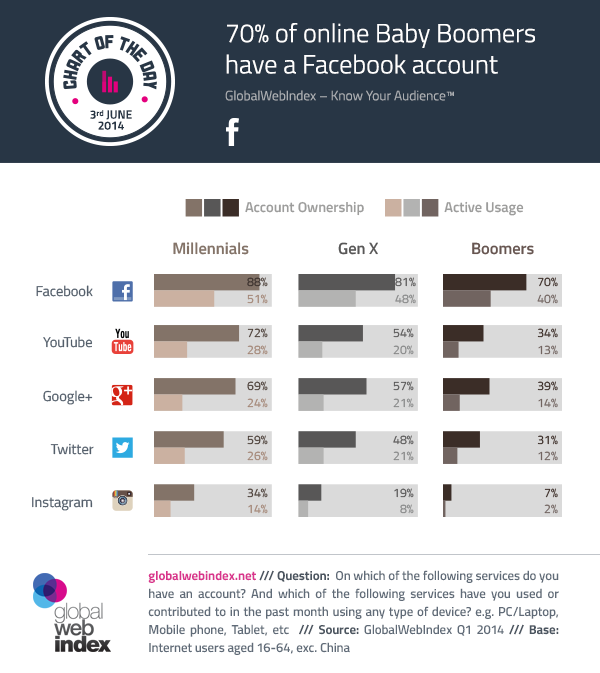 Baby boomers account for more than one-fifth of all social media users, even if they do stick to orthodox networks like Facebook. Office Communication programs: Programs such as Skype and chat enterprise apps allow co-workers to discuss projects and tasks as well as parties and after-work events. They are excellent alternatives to public social media options. Gen Xers perceive change as a vehicle for new opportunities and they’re not afraid to embrace it. Those in Generation Z, on the other hand, are accustomed to change as they expect it in the workplace. The study didn’t mention baby boomers’ attitudes towards change, but we can deduce that they are less enthusiastic about it. They’re more likely to prefer a stable work environment. The study found that millennials prefer collaborative and technology-centric vehicles, given the relationship with omnipresent technology and the investment made in personal coaching nowadays. Baby boomers and Gen X like to learn via traditional instructor-led courses or self-learning tools. Each generation is able to bring assets to the workforce, no matter how experienced or otherwise it is. But with diversity comes the burden of choice – and one size does not fit all. Communication is the single most important method of truly overcoming this generational gap. But creating a standardized communications strategy for an unstandardized population feels like an impossible mission. How can one expect employees to build relationships when their communication preferences are ostensibly incompatible? This suggests that managers should first be aware of the differences mentioned above, in order to communicate effectively and to avoid becoming caught up in stereotypes. Let’s look at some of the managerial tactics that can be used to get employees of all generations working efficiently together. This goes especially for the newer professionals. The best way to help them integrate with the rest of the workforce is to let them take the lead on some projects. This will enable them to share their background and areas of expertise. Anything that can take employees away from their routines is good and healthy for your employees’ relationships. Where I work, going off-site, like organising an event or an exhibition, is the most efficient way for me to get to know my coworkers, and to talk and laugh with people I wouldn’t normally meet or even talk to in my day-to-day job. Managers should look for ways of working that enable the different generations to learn from and engage with each other. Mixed-age project teams can be the starting point. As generations are used to receiving information in different ways in their personal lives, managers should tailor their communication methods towards each generation’s strengths, personality and aspirations. To reach baby boomers, for instance, you can direct email them. One way to delight them is to offer them coupons; many of them were brought up in environments where saving money was important, so this approach may be effective in reaching them. Mobile and desktop email alike appeal to Gen X as well. You can grab their attention through educational content too. In fact, over 10 percent of them have completed a doctorate or other professional degree. This should give you an idea about how to communicate with them. As for millennials, it’s all about mobile. If you don’t have a website or a blog or a platform that is mobile-friendly, then don’t count on getting along with this generation. 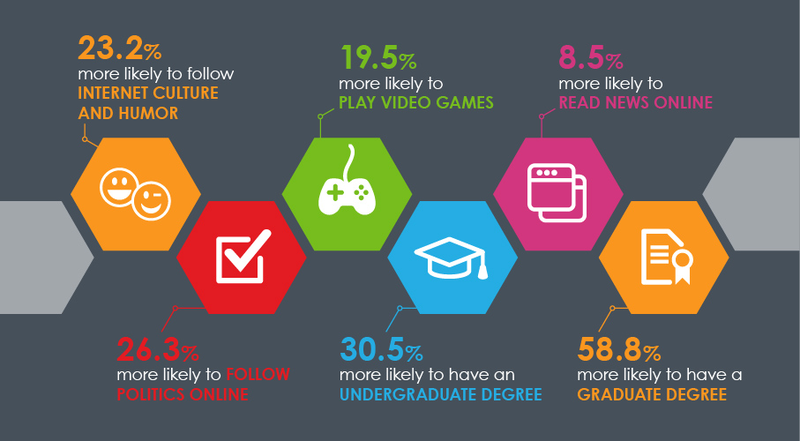 Also, authenticity and the real-time nature of some platforms appeal a lot to millennials. As simple as this might seem, you can learn a lot by just listening to your employees. If you want to open up communication between generations and build relationships, just ask them about their preferences, interests and expectations, and then listen carefully. Engage in a dialogue and see where it leads. Leaders who listen to their employees from the time they join the company understand that high-performance cultures are mainly built on relationships and based on communities of common interests. Ultimately, managing generational differences in the workplace is all about creating an environment where people understand and appreciate various points of view, even if they differ from how they saw things going. By understanding the different mindsets and tendencies of different generations, you can make your efforts go further by creating a less fragmented workforce and making people of all ages build relationships with each other. Appeal to the right people in the right way and you will have a workforce that operates beyond mere policies and processes, and strives to put in that extra amount of effort. Are there any specific strategies you’ve found to be effective in managing a multi-generational workforce?